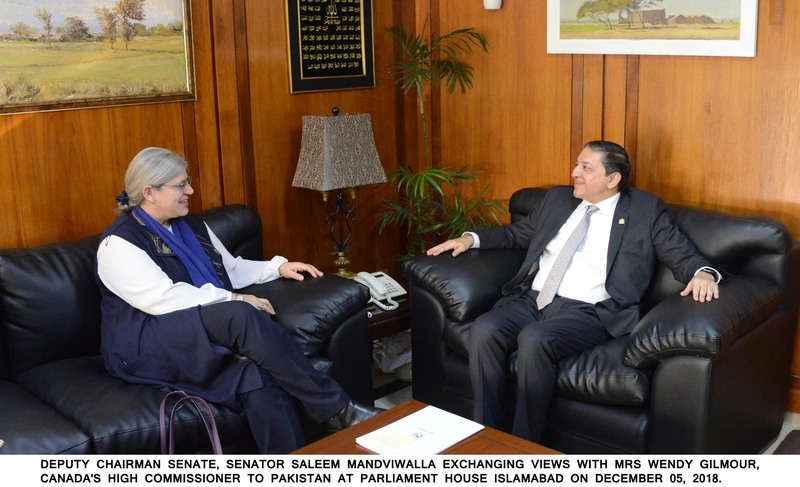 Acting Chairman Senate, Senator Saleem Mandviwalla has observed that there is huge scope for enhancing trade and investment between Pakistan and Canada as the current level of trade and investment is not up to the mark. He said that business companies of both the countries can explore more business opportunities for mutual benefit of the people of two sides. He expressed these views in meeting with Canadian High Commissioner Wendy Gilmour here at Parliament House on Wednesday. Both sides discussed matters of mutual interest and exchanged views of different issues including trade, investment, parliamentary cooperation, student visa issues and others. He said that Pakistan highly values its bilateral relation with Canada and desires to further expand these friendly ties. He underscored the need for enhanced parliamentary interaction and people to people contacts. The Acting Chairman Senate also recalled his recent visit to Canada where he had fruitful interactions with parliamentarians and other high ranking government functionaries. He said that there is need to increase trade activity between the two countries. The Acting Chairman Senate highlighted some significant areas like surgical instruments, textile goods, leather, agricultural and others in which exports to Canada can be enhanced. The Acting Chairman Senate also stressed upon the need of bilateral investment and digital trade. Mandviwala highlighted that there is huge potential in Pakistan but due to visa issues students prefer USA, UK and other European destinations for education and achieving higher qualifications. He said that students need to be facilitated to get education in Canadian educational institutes of higher learning. Senator Dilawar Khan also underscored the need for enhanced parliamentary cooperation and trade linkages. Canadian High Commissioner agreed with the views of Acting Chairman Senate. She said that security situation in Pakistan is improving and more parliamentary cooperation would pave the way for enhanced linkages between the two sides.